G-AsiaPacific started as a Microsoft Silver Certified Partner in 2015. In just one year, we progressed and became a Tier-1 Cloud Solution Partner (CSP), enabling us to provide an end-to-end experience for clients. Instead of working with two different partners for licensing purchase and project deployment respectively, engage with our Microsoft Azure certified G-AsiaPacific team for the complete transformation service, eliminating any IT hassle or worries you might have. Platform-as-a-Service (PaaS) is probably Azure’s strongest element, but what does that really mean? You are able to build and develop middleware, tools, database management systems and many more without the need to maintain an infrastructure. You manage the applications and services you develop, and G-AsiaPacific will leverage on Microsoft to manage everything else. Every enterprise needs a Customer Relationship Management (CRM) system as it enhances your interaction with your prospects and existing customers. Whether you already have a system in place like Microsoft Dynamics, Sugar CRM etc, or are just starting out from scratch, G-AsiaPacific is here to explore CRM options with you and ease your journey in your IT cloud transformation. G-AsiaPacific understands that sometimes an enterprise is not ready to move to the cloud completely, hence we provide Hybrid Cloud solutions – the combination of a public cloud provider (Microsoft Azure) with a private cloud platform — articulately curated for your business.  Microsoft has a total of 38 Azure regions, more than any other cloud provider in the world.